Pasta salad! It's at every potluck and picnic you'll attend this summer, and while each person's recipe might differ slightly (or broadly), it's usually pretty safe to add a hefty scoop to one's already-overflowing plate. If I'm being honest, this pasta salad recipe is pretty boring, but we like it. Thanks to our bumper crop (or, more accurately, the yield one might expect from 30 or so plants), there are just as many tomato halves as there are noodles, but you can definitely adjust the amount. Heck, you probably already have a go-to pasta salad recipe, but thanks for checking mine out anyway! Bring a large pot of salted water to a boil. Add pasta and cook for 8 to 10 minutes, until al dente. Drain, and rinse with cold water. While the pasta is cooking, in a large bowl, mix the cucumber, bell pepper, tomatoes, and Parmesan cheese. In a jar with a lid, mix the olive oil, vinegar, basil, oregano, ground mustard, salt, garlic powder, and pepper. Seal jar and shake well. Add the cooled pasta to the veggies, then pour the dressing over the salad and toss to coat. Cover, and chill for at least a couple of hours in the refrigerator. Add a little extra oil if it seems dry when you get ready to serve. I have a pasta salad recipe I love to make...but never make it for family as they think it's boring and most of them don't want pasta in their salads anyway. Soooo disappointed in them. :) Mine is similar to yours except I add black olives and don't use cukes. One big difference is I use Wishbone dressing! Don't tell! I just like it in that salad...weird of me, I know. I don't eat pasta salad as often as I used to..well, trying hard to live on low-carb.. but when I do, I like mine with lots of veggies like this. YUM! I've never had a pasta salad that doesn't include a mayo-based dressing. I always shred carrots and pickles for mine, sometimes adding tuna, and assorted veggies depending upon what's around. Your dressing sounds good, and your tomato crop is wonderful. I love this kind of salad in the summer. No need to worry about dairy and mayo when we are out having fun! Hehe I love Seinfeld references and that show is brilliant and timeless. I can still watch episodes even though I've seen them 20 times already! :D Ahh fusilli Jerry! There are some good sitcoms that give "Seinfeld" a good bit of competition. "The Mindy Project" (which is moving to Hulu and reminds me I need to nix my Netflix subscription for Hulu), and "Odd Mom Out" on Bravo are worth checking out. And my all time fave "Better Off Ted" was nixed some time ago but I still like to watch on Netflix. On to your pasta salad...great use of your cute tomatoes! I love tomatoes in my pasta salad and tend to over use as well. My family isn't keen on pasta salad, so it isn't something I make often. Now I am craving it! I love Seinfeld! I also would love this pasta salad. YUM. 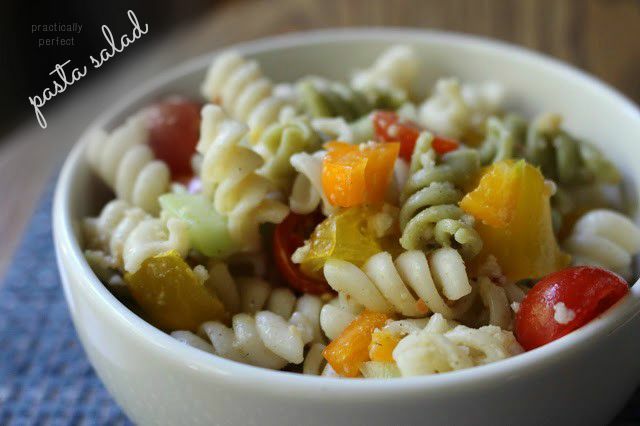 Summer is not complete without a great corkscrew pasta salad. It's always a crowd-pleaser. I'm sure I'll be making this one a lot in the months to come. I don't think it looks boring at ALL - it looks summertime perfect! Yay, pasta salad! I love these pasta dishes. Whatever veggies we're growing in the garden we throw into a dish like this. Right now it's lots of tomatoes, carrots, peas and radishes! Yum! yum! Looks delicious! Wish I could have it now! SImply damn delicious n refreshing pasta!!! I don't think it's boring at all! Pasta salad in a vinaigrette with fresh vegetables is a perfect summertime meal. Love it. I am so smiling at all your tomato recipes!